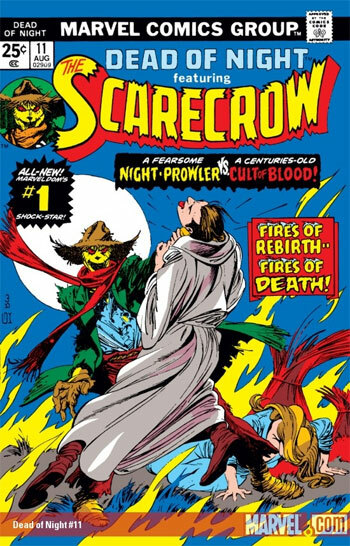 This week we will be celebrating Halloween here in the states, so what better way to do that on Flashback Universe than by presenting some of my favorite C-List and D-List creature comics from the Bronze Age? Sure you know Man-Thing and Ghost Rider but how many of these old school monsters do you remember? 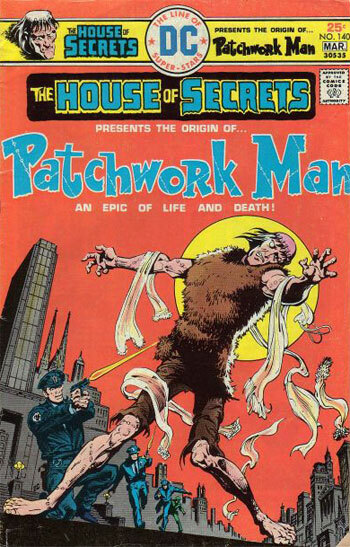 At some point Marvel decided to start calling this character Straw Man (probably to make sure they could capitalize on his huge (huge I say!) fan base and not worry about legal back and forth with DC's similarly named character. Despite only a handful of Bronze Age appearances, this character hasn't completely faded into obscurity. In 2002, he appeared in Brian K. Vaughn's The Hood mini-series and then in 2006 in Nick Fury's Howling Commandos. 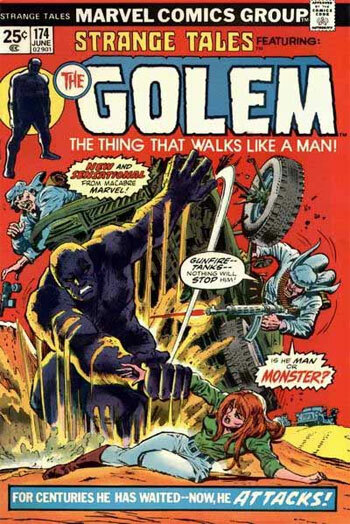 This character is not related to the Golem character than appeared in a few Invaders issues. 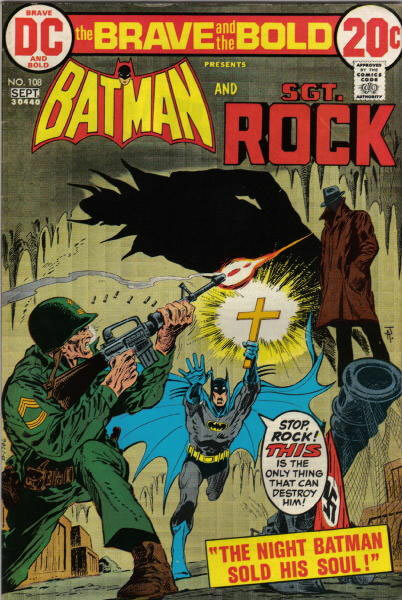 Young Jim Shelley had no interest in War comics, so I completely missed this when it was in the Spinner Racks. I always forget about it now that I'm older, but it really looks like something I would dig. 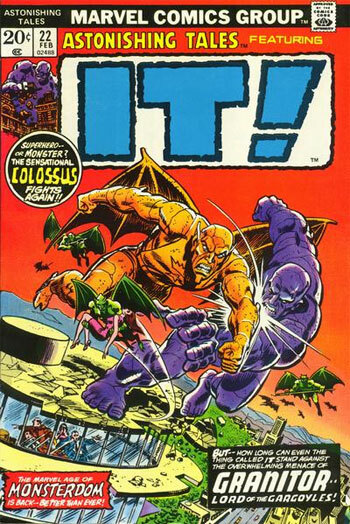 Marvel's only Godzilla sized monster, IT! is one of the few Marvel monsters who never managed to make an appearance in either Marvel Team-Up or Marvel Two-In-One. I suppose his (very) limited run and huge size both worked against him. 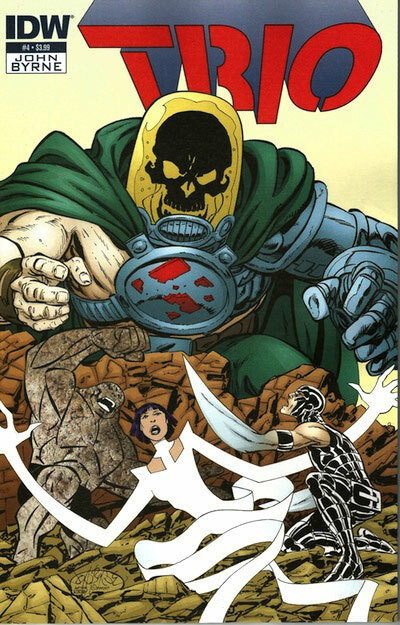 Marvel has tried a couple of times to relaunch this character in these Zombie-favorable times. 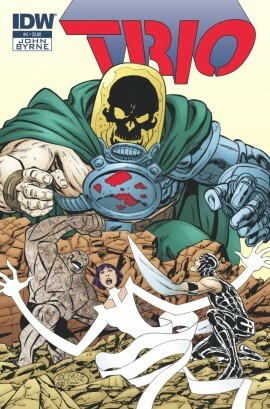 In 2006 with a 4 issue mini-series written by Mike Raicht which was followed up by another 4 issue mini-series by Eric Powell. However, neither of those minis came close to Walking Dead numbers, so there's less life in the Living Zombie than his name would suggest. I wonder if this premise would make a popular television show? He may have not held his own title, but this Creature from the Black Lagoon inspired monster did manage to get star billing on the first (and only?) 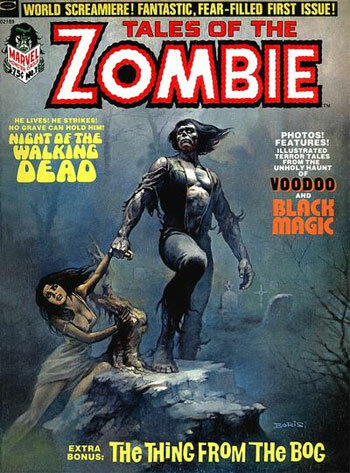 black and white issue of Legion of Monsters. 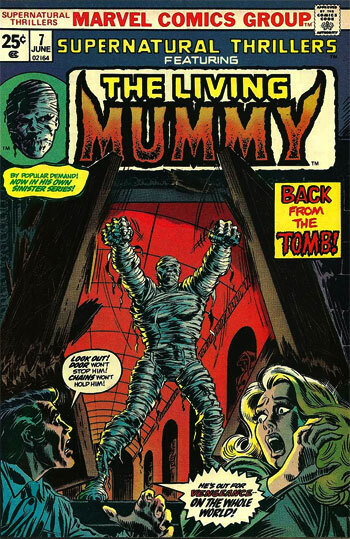 Despite being another one of the lesser known Marvel Monsters, The Living Mummy had a pretty long run compared to some of the other people on this list. He also appeared in Marvel Two-In-One. So, how many of those did you remember? Was there someone you think I should have included? 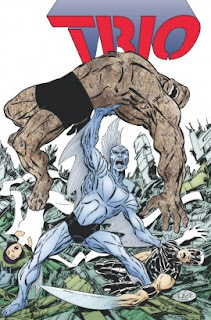 If you want a comic that is even MORE fun than TRIO, then go get yourself the Fantastic Four Omnibus by John Byrne. Damn that is a GREAT comic. Although I almost wish the Marvel Omnibus it was using the same paper as the TRIO comic. Yes I know that some people are pissed when they don't uses the shiny glossy paper when they make comics in the Omnibus format (yes I am looking at you Chris Sims ;) ), but I think the shiny paper does not always make older comics look good. Some older comics artwork don't look too flattering when printed on that shiny paper. So, personally I don’t mind that the Kirby Omnibi are printed on thick newsprint. Although the Fantastic Four Omnibus does not look bad, but the colors do look a little bit oversaturated on that shiny paper. But that is a very nitpicky thing. It is an AWESOME looking comic despite that. I was surprised that it started with the Marvel Team-Up issues with the Human Torch drawn by Byrne. 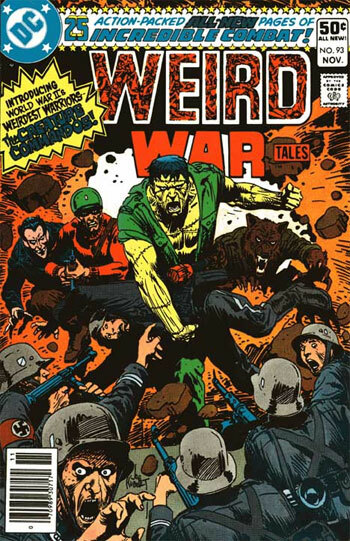 Then it also had a Marvel Two in One issue by Byrne. And we got the first run of FF with Byrne written by Marv Wolfman and inked by the legendary Joe Sinnott. The sad part is that I had bought the Search for Galactus Premiere HC that already had some of the first FF run with Byrne. So once more, when I bought the FF Omnibus, ended up buying comics that I already owned. Although to be fair, I already had most of them comics in that FF Omnibus. The only NEW comics I got in that Omnibus were the Marvel Two in One #50, the Avengers # 233, the Thing #2 and the FF Annual #17. Although as a kid, the FF comic that I bought was in black and white, and it contained two FF stories per issue. And we only had the cover of only one of those two stories. 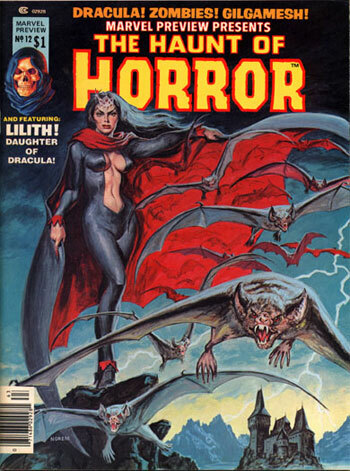 Si a lot of the covers in that book were new to me. The Omnibus does not contain that many extras, but it does contain a few. It has a lot of the characters that Byrne did for the Official Handbook of the Marvel Universe. Some TPB covers. And a page 18 from FF#242 (see below) that was taken out when they made the Trial of Galactus TPB. But for some reason, it was not added back in for this collection. It was simply added in the extras at the end. WHY??? That makes no sense, why not put the page back where it is supposed to be?? Somtimes I sure do scratch my head at some of the decisions that are made when making them comics. Some of the TPB covers that are in the extras were recolored with more modern coloring, and I have to admit that I like it. 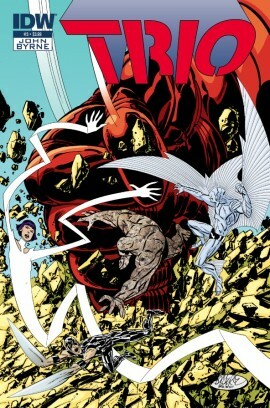 I have to wonder why the Walter Simonson Thor Omnibus was recolored, but this one wasn't. What made Marvel decide that Thor should be recolored, but not the FF, or any other Omnibuses?? But still, despite my few minor complaints, the FF Omnibus is an AWESOME comic that anyone should own. I can't wait to get my hands on the second volume, if Marvel ever decides to publish it. Heck we are still waiting for the second Uncanny X-men Omnibus with the end of the Dark Phoenix saga, and the legendary tale Days of Future Past. I guess we have to be patient with them Omnibuses. But if you don't want to spend hundreds of thousands of dollars for the FF Omnibus, then go get the TRIO TPB for about $18. Note from Jim: It seems Pierre and I are getting in a groove of posting every other week (more by providence than by planning.) As such, Pierre (pictured below) provides us with today's post: A look at a comic you may not have heard of, but may want to check out! I can't help but think that IDW are doing a good job in general with their comics, especially with their Artist Editions. If I was more of a foolish fool then I already am, I would be buying wayyy too many of their Artists Edition. I own the Wallace Wood one (which will require a blog all of its own at some point) and have to stop myself from buying more. But in one of my visits at the comic shop close to my place... I could not help but notice John Byrne's new series...TRIO. No... It is not the logo, or the artwork that got my attention. It is the non glossy cover. It looks like some very think bond paper, and I liked that paper. I don't like the glossy paper because too often you have to tilt the comic in order not to have a glare on the page as you try to read it or as you try to admire the artwork, but the TRIO cover paper was perfect, and it fitted perfectly with Byrne's artwork. But I did not pick it up. For the past, 10 years... I have been pretty much a TPB buyer. Sometimes I will get the single issues... but more often than not, I will decide to wait for the TPB. Why says you once more?? Because wayyyy too often I end up buying the same comics multiple times. And I know what many are thinking... TRIO?? really?? I know what you guys are thinking because I had the same thought at first. and something not unlike Galactus. But although it is derivative from the Fantastic Four... I enjoyed it. I had a great time reading that comic. It has that retro feel not unlike what we tried to do at Flashback Universe, but as opposed to us guys who try to recapture the magic of the comic we read a few decades ago... here it is MADE by someone who was already making comics all them decades ago. 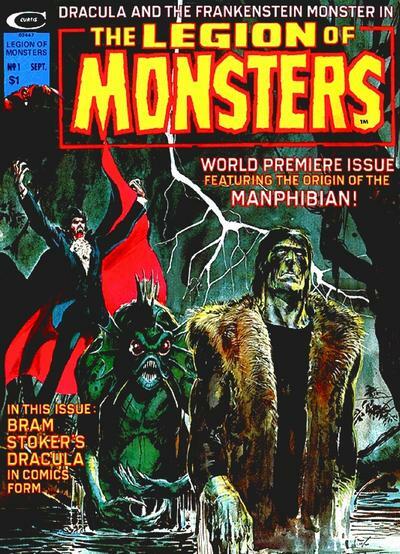 Classic super-heroes... huge monsters... EVIL Nazi villain, this comic has it all. My biggest complaint with the TRIO TPB is that it ends on a cliffhanger. I would have much preferred to have a complete story in the TPB, and I can understand if it is a turn off for some people. ...but it still is a fun comic. Continuing my posts on different types of bad comics. Today I'll introduce one the types that usually cause the most uproar - those wherein the writer has played havoc with established continuity. Again, I'm not one of those people who feels all comics should be slaves to continuity. 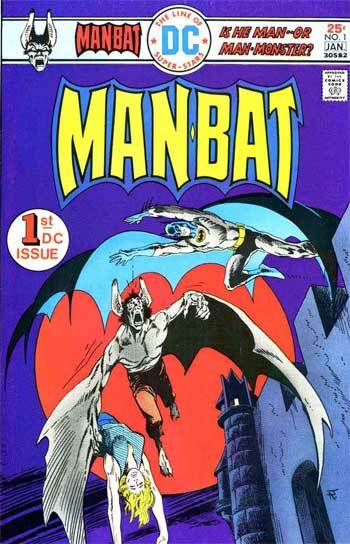 One of my favorite comic writers (Bob Haney) was notorious for not caring about continuity. The saving grace in Haney's stories (and for most comics of that era) was they didn't rely on you knowing what happened in the last issue. Still, once you've decided to tell an ongoing story in serial form, then you have pretty much agreed to obey some laws of continuity, or put another way, the more you are relying on continuity to give your story gravitas, the more important continuity becomes. Modern comics rely (overly much I think) on wanting the reader to be invested in ongoing storylines - which results in continuity having a greated influence than it didn in the Silver Age. 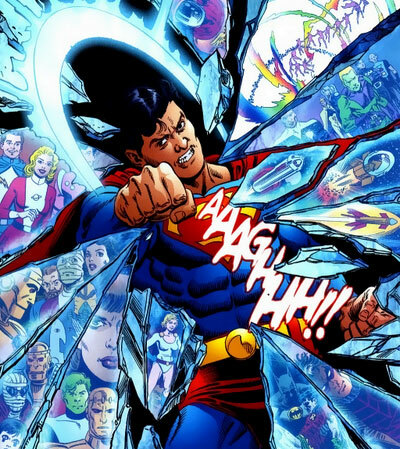 As a result, there have arisen two types of Continuity contagions that can ruin a comic. Today, I'll tackle what I see as the most comic problem: Devalued Continuity. Over time, as writers and editors come and go on a series, it's not uncommon for some editorial mandate to force a writer to come up with a contrivance that basically oblivates established story lines. When doing this, if the events that the writer serves up are too far fetched, it runs the risk of diminishing the story line's continuity in a way a ignored plot hole never could. Probably the beginning of this problem was the return of Jean Grey in X Factor 1 from the 90's. The original premise of the series was that the four original male X-men would be joined by an undetermied female. This unused cover actually shows how far the series got in production without a decided upon fifth member. 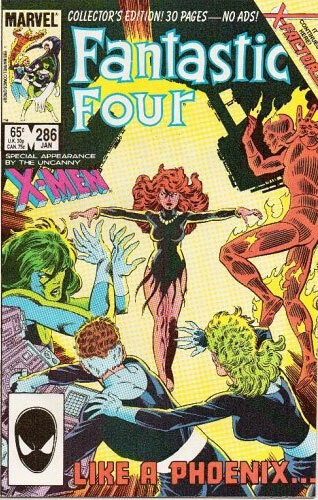 However, an editorial decree made it necessary for Marvel to find a way to bring Jean Grey the dead. The solution? Well, that came from a fan letter from Kurt Busiek. He suggested that the Dark Phoenixed Jean Grey who died in X-men 137 was an alien who had assumed the original Marvel Girl's identity. 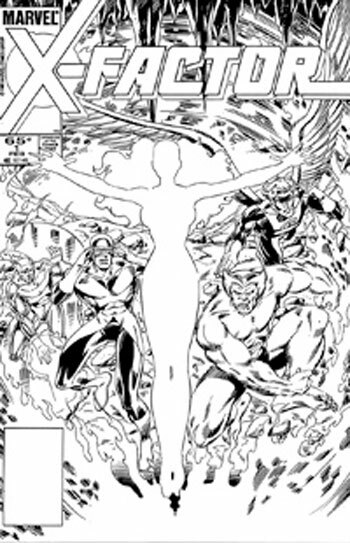 Kurt had this idea that the Phoenix had duplicated Jean and left her in a pod on the bottom of Jamaica Bay. 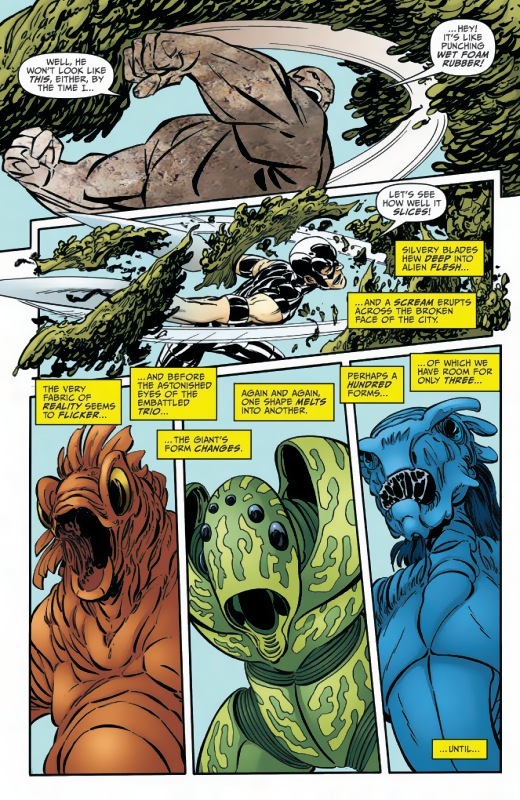 The actual story in which this all was explained was in Fantastic Four 286. All these events may be "in continuity," but hasn't the writer undermined the value of the Marvel Universe with these type of shenanigans? I think so. And I think we see more of that now than we have ever seen before (partly because writers have gotten lazy) but mostly because editorial is driven by a need to satisfy the capricious demands of a superficial fan base. Instead of thinking about whether a story will be good, it's become more about putting the old toys back in the box. Whatever gets Hal Jordan back as Green Lantern is good enough to make the cut. As a result ,we've been getting some really bad stories. 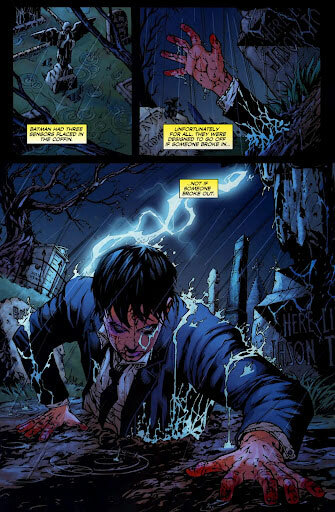 ...don't satisfactorily explain to me how Jason Todd came back to life. Ultimately, if continuity is the coin of the realm, you run the risk of becoming penniless overnight when you do things like have an Editor in Chief Joe Quesada explain away a 20 year marriage of Spider-man and Mary Jane with words like, "It's Magic. We don't have to explain it." Perhaps the big two can use Magic to make us care about their universes again.